Recently, a Cradle prospect asked if dashboards could show more than just the status of items and include how stable they are too. Their point being that if 80% of the requirements are Accepted how long have they been that way? Did people try to push changes in the last week to meet a deadline or are we reaching a point of stability where Accepted is high and changes are low. 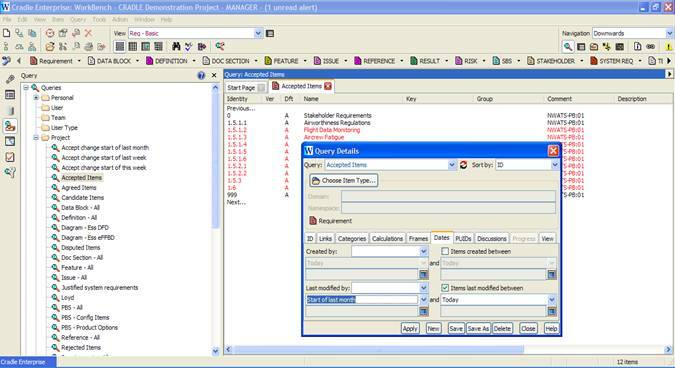 The DEMO project includes a Project Summary dashboard that contains a number of KPIs of which Accepted, Candidate, Disputed, Rejected and Under Review report as a percent of the total requirements. This provided the status the prospect was looking for but not the stability. From his perspective showing that these requirements have not changed in the last week or month speaks highly to the confidence and accuracy of the changes made. We have taken the Project Summary dashboard and created a new example which we have called Requirement Stability. More options are available but we have not used them in this example. If 50 items have changed since last month but only 30 items since last week and only 10 this week we can see that a good portion of these accepted requirements are stable. If it shows 50 items have changed since this month, 45 since last week and 30 this week we can extrapolate that there is still a lot of active change in the project. To create the new dashboard we started with the Project Summary dashboard, selected line items not needed for the new dashboard and deleted them. 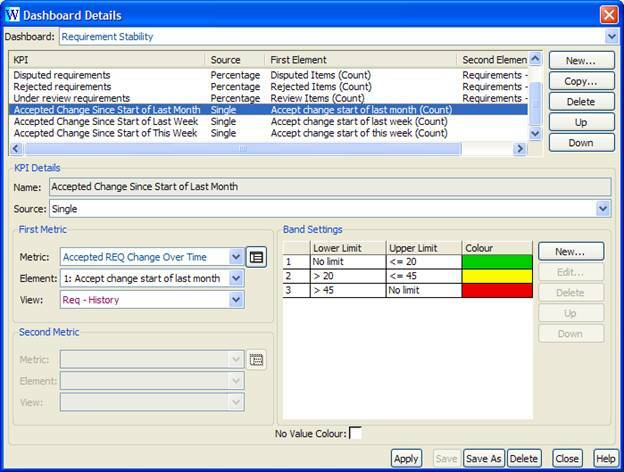 This left seven line items showing the total number of requirements and what percentage were in each of the Status categories. To create the three new lines we needed to start by creating 3 new queries. 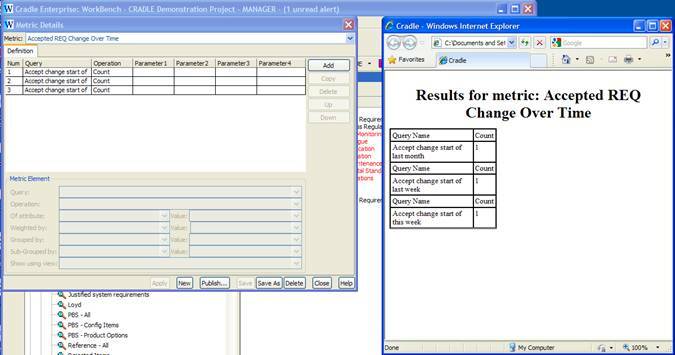 From the Accepted Items query (used to create the percentage statistic in the existing dashboard) we adjusted the Dates tab by selecting the items last modified between check box and saved a query each for “Start of last month”, “Start of last week” and “Start of this week” all of which calculated through “Today” as the other parameter. Once the metric was saved we can return to edit the dashboard and add KPIs for each timeframe. To do so we selected the metric that we had just created and set the Element to be the query results for changed since last month, last week and this week. As tracking change is the primary reason for these KPI our default view was set to Req- History. This way if you click the KPI on the dashboard it will show the items changed in that time period and the change history for those items. We also set colour bands for what might be considered acceptable quantities of changes for the time periods in question. The resulting metric shows both status and stability of the items in the project. If you would like a demonstration of Cradle’s dashboard facility or have questions on creating your own, please call or email your 3SL contact. If you do not have the dashboard module we can provide details for purchasing licenses or an evaluation licence for your system to include these while you review their usefulness.